This Thursday the pair EUR/USD was strengthening thanks to the growing demand for Euro. Macroeconomic forecasts for Germany didn’t prove accurate, unemployment claims increased once again. Although German CPI gave Euro some support, the index has risen by 0.2%, exceeding forecasts by 0.1%. European currency is still strengthening, though upward impetus is going to die soon. We are glad to inform that Varengold Bank FX pays interest rates of up to 3,1% yearly on client accounts. Australia’s trade deficit reduced for the second month running, with forecasts predicting it to move to surplus in 2014, mostly as a result of rising mining exports. In September the country’s trade deficit narrowed down to $284 million, a reasonable leap from $693 million the previous month, according to a statement made on Wednesday 6th November by the Australian Bureau of Statistics. Following significant growth last week the pair GBP/USD has corrected downward. The decline was triggered by the data on mortgage lending in the UK (forecast:45.2 thousand, actual value:42.8 thousand.) 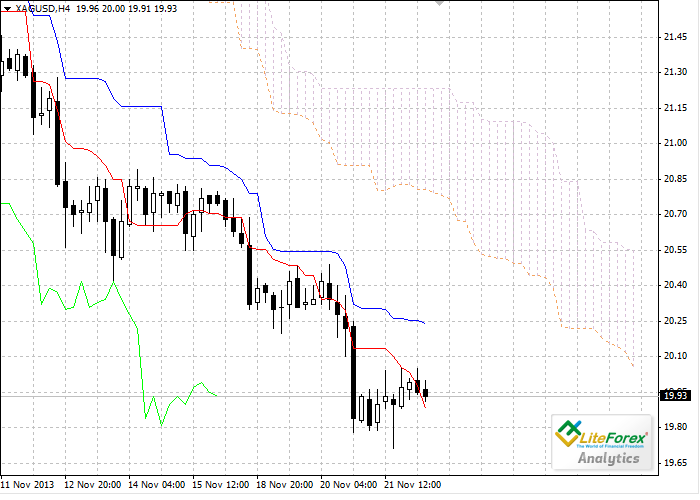 Meanwhile the USD was supported by the news about agreement on oil delivery expansion between Iran and USA. Core Liquidity Markets Pty Ltd, an Australia-based Forex, Metals, CFDs and Binary Options Financial Services Firm, has announced a new Credit Bonus Offer for new and existing clients. Let’s look at the four-hour chart. Tenkan-sen line is below Kijun-sen, they are both horizontal. Chinkou Span is below the price chart, current cloud is descending. The price has broken through the cloud but been corrected above the red line after the fall. Tenkan-sen (0.8184) and Kijun-sen (0.8258) lines have become support and resistance levels respectively. Let’s look at the four-hour chart. Tenkan-sen line is below Kijun-sen line, they are both directed downwards. Chinkou Span line is below the price chart, current cloud is descending. After long fall the pair has been corrected above the Tenkan-sen line, which becomes a support level at 19.88. The closest resistance level is Kijun-sen line at 20.24. Sometimes it seems like the USA is too much obsessed with what the Russians thinks about it. The Americans are os obsessed with the issue that they still keep on publishing new replies to Vladimir Putin’s statements published in The New York Times.